The battle of the light-brights rages on! 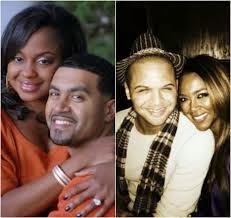 After witnessing Real Housewives' of Atlanta's Apollo Nida attempt to pummel Kenya Moore's good friend (cousin?) Brandon DeShazer to smithereens, even I was slightly traumatized by the way everything went down. His anger came completely out of left field for the viewers that didn't realize that Apollo knew that the Feds were on his tail at the time that episode was filmed. And now Kenya is speaking out to S2S magazine on behalf of Brandon. Apparently he was so scarred by that night's events but he is "ok now". On this Sunday's episode, we see Brandon contemplating whether or not he should press charges against Apollo. Go file them papers, boo! I'm guessing if Brandon really wanted to get Apollo thrown in the clinker, we would have heard about (another one of) Apollo's arrest in the news by now. I also vaguely recall hearing that it is in their Bravo contracts that they are unable to press charges against their cast mates but since Brandon isn't a regular on the show, he might be exempt from that clause.